A team of 22 North Dakota educators, early childhood service providers, and caregivers completed an extensive review and revision process of the North Dakota Early Learning Guidelines and Prekindergarten Standards. 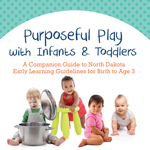 The North Dakota Departments of Public Instruction and Human Services adopted the North Dakota Early Learning Standards: Birth to Kindergarten in the fall of 2018. The Standards provide a set of expectations for children’s early learning and development from birth to kindergarten, and guide the design and implementation of curriculum, assessment, and instructional practices with young children. 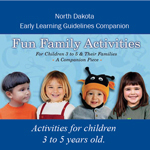 Our Early Learning Guidelines Companions Guides are packed with tips and play activities that child care providers and families can use to enhance children's learning and development.